Winner Of 2018 Good Food Awards! Golden Rule is our signature orchard blend comprised of apples cultivated from our organic farm in Sebastopol, California. Our beautiful Golden Delicious Apples are dry-farmed and blended with local organic heirloom apples for a perfect tart, crispness that is a compliment to any meal! Apples: 85% Golden Delicious with 15% Jonathan, Rhode Island Greening & Gravenstein. 100% organically grown in Sonoma County. Conveying the exhilarating aromatics that only develop in tree-ripened Golden Delicious apples, this cider is floral and robust. Sparkling and truly dry, enjoy notes of melon, vanilla and honeysuckle balanced with a hint of nutmeg and citrus acidity. Golden Rule gives a delightful new perspective on a favorite old variety. Gravitude pays homage to our local heritage apple, the Gravenstein. Introduced by Russian pioneers in the 1800s, this variety gained Sonoma County national apple growing notoriety in the 1900s. Now endanger of extinction, the ‘Grav’ is honored by the Slow Foods Ark of Taste for it’s delicious and distinct flavor. We’re grateful that local cider is bringing renewed life to this great old apple and you will be too! Apples: 90% Gravenstein with 10% Jonathan and Rhode Island Greening. 100% organically grown in Sonoma County. 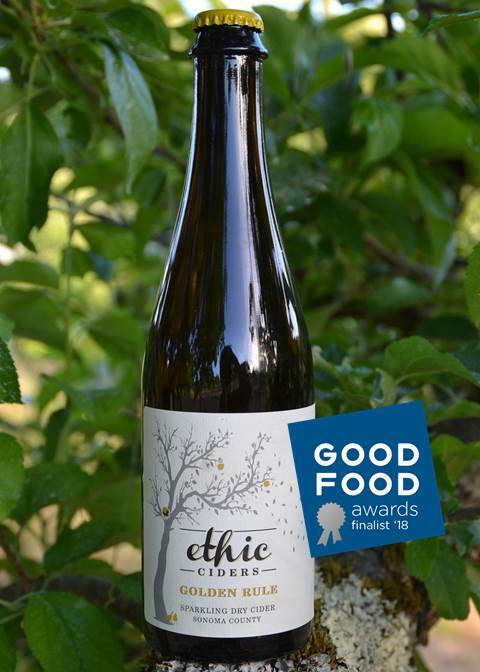 Sparking and fully dry, this cider is delicate and graceful with lively acidity. Notes of apricot and rose petal dance with refreshing chalky minerality. The Gravenstein’s charismatic acidity is long on the finish but quick to beckon you back for another sip. An embodiment of peak summer love – Gravenstein season! Best served at 45 -55F in a white wine glass. This seasonal cider release is a loving tribute to Ned & Michelle's young niece, Scarlett. Beautiful, playful and wildly charismatic. Made with dry-farmed heirloom apples layered with whole local raspberries and blackberries picked at peak ripeness. Effervescent and dry with a lush berry finish. Montage brings together some of our favorite aspects of each harvest. Combining small lots of our rarest Sonoma County fruit, each Montage is unique, never to be recreated. 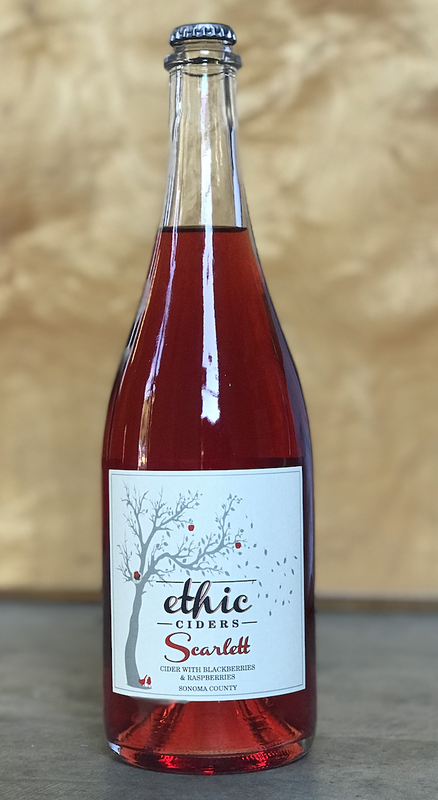 For 2017 it’s a blend of heirloom and bittersweet apples layered with wild harvest pears and crabapples, aged on Hungarian oak. Notes of ripe pear, vanilla, orange peal, walnuts are structured by seedling pear tannins and a soft but focused acidic finish. 65% Johnathan, 12% Rhode Island Greening, 10% Sierra Beauty, 6% Nehou, 6% wild pears and 1% wild crabapple. All fruit Certified Organic or wild harvested from abandoned orchards. Butternut squash soup and rustic bread, roasted root vegetables and wild rice, manchego cheese and fig jam, pork chops and pear chutney.